ALS in French, signed “C. Pissarro,” one page, 4.25 x 7, June 1, 1900. 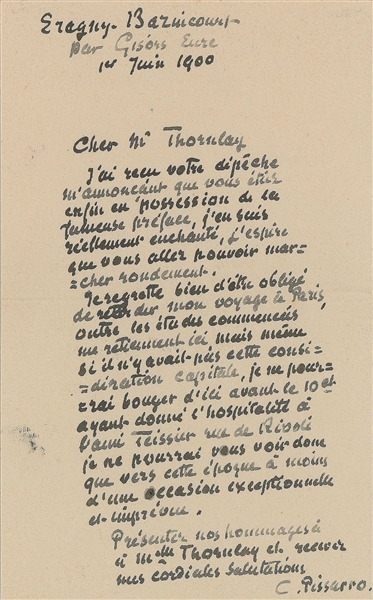 Letter to Georges William Thornley. 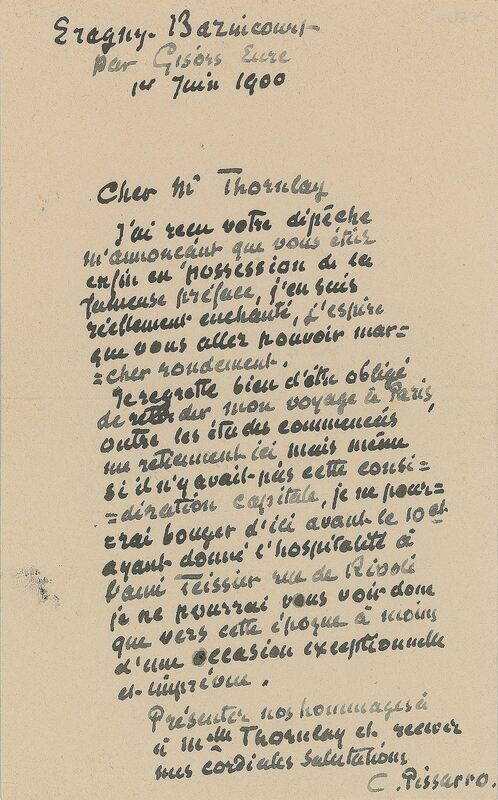 In full (translated): "I have received your message announcing that you are finally in possession of the famous preface, I am truly delighted for this, I hope that you will be able to hustle things on. I regret very much to be obligated to delay my trip to Paris, in addition to started studies that are holding me back here, but even if it were not for this major consideration, I could not leave here before the 10 and having given hospitality to friend Teissier rue de Rivoli consequently I could not see you until around that period unless of an exceptional and unexpected occasion. Pay my respects to Miss Thornlay and my warm greetings to you.” In fine condition. An acclaimed printmaker, Thornley collaborated with Pissarro in 1900 to publish a limited edition suite of lithographs. It featured a preface by Gustave Geffroy, an art critic who championed the impressionist movement, which Pissarro mentions in this letter. Desirable artistic content regarding the publication of his work.